Do you live in one of the 300 million plus households that has a gun? If you do, where do you keep yours? Under the bed? In the closet? On the back seat of the car? In your pocket? In a securely locked safe box? Day in, day out, kids are killed or injured because adult gun owners leave their weapons, maybe even just for a few minutes, in places where kids find them. 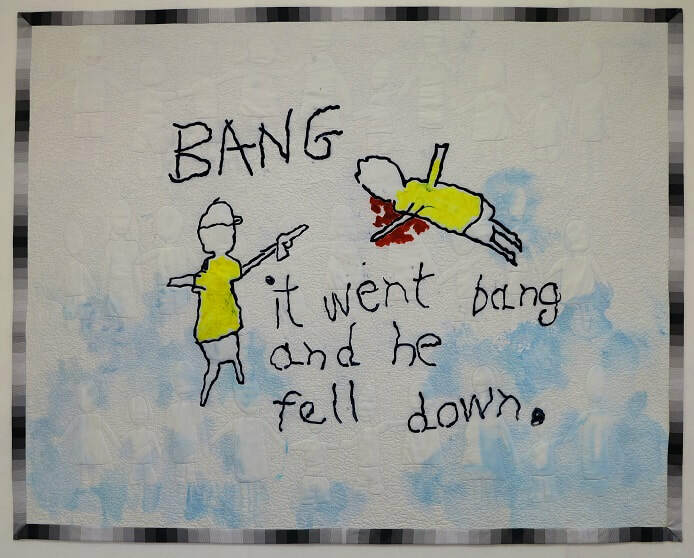 I have chosen to tell the story from the viewpoint of a child around 4 years old, depicting the shocking reality of what can tragically happen when kids find guns. Most often it is friends or siblings who are the victims of these unintentional shootings, destroying not only the life of the child who is killed or injured, but that of the shooter too. If you know someone who is way too casual with their gun, will you say something? And if you are a gun owner, tell me… where is yours right now? I want this quilt to tell the story of the children and their families who pay the price for those who are careless with their weapons. More than 1 child per day, every day, is injured or killed in the U.S.A after another child finds and fires a gun. The shocking thing is that these injuries and deaths are seldom newsworthy enough to even be discussed. Click here for a link to a website which keeps a daily update of all reported child gun injuries and deaths. It makes for harrowing reading. This quilt is currently on tour in a SAQA exhibition named 'Loaded Conversations'. To see a video of the other quilts selected for the SAQA 'Loaded Conversations' exhibition please click here. Artists audio statements are also available for this exhibition by clicking here and then clicking on 'more info' next to each of the quilts.